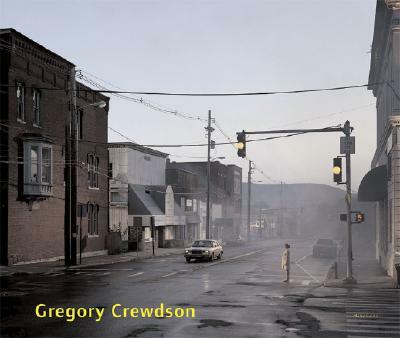 Gregory Crewdson's photographic series capture a particularly American state of normalcy--in dissolution. The viewer, at first seduced by what appears to be an idyllic scene, soon discovers subtle off-kilter elements more akin to Film Noir than an NBC comedy. In a work from his Twilight series, yellow school buses are parked outside white wooden houses, and students stand and lounge around in seeming passivity. Something is happening--what, we don't know. The vision is familiar yet unfamiliar, seemingly benign yet threatening. Crewdson goes to great lengths in dramatizing his disturbing suburban scenes, employing elaborate lighting, cranes, props and extras, espousing a level of behind-the-scenes preparation more akin to the making of a Hollywood movie than the making of a still image. Here perhaps is one place to locate the eerie unreality and narrativity of his pictures, the creepy attention to detail so out of place, in the ordinary settings he evokes. Middle-class reality meets the other side of the normal here--by way of Sigmund Freud.